Vicente del Bosque will face big decisions in naming Spain's final World Cup roster. MADRID — It finished Spain 1-0 Italy, but Thiago Alcantara was the real winner in Wednesday’s international friendly in Madrid. Pedro Rodriguez got the goal for the defending world champions at Atletico Madrid’s Estadio Vicente Calderon, with Diego Costa and Cesar Azpilicueta also giving La Roja boss Vicente del Bosque plenty to think about ahead of this summer’s World Cup. The recently deceased Jose Luis Aragones Suarez, who coached Spain to the Euro 2008 trophy, was recognized pregame off at his old Vincente Calderon home. Once the action began, the focus was on which of Spain’s new emerging stars would impress, and which of Aragones’ former charges might miss out on Brazil 2014. Veteran defender Carles Puyol announced this week that injury issues meant he could no longer continue past the end of the season with Barcelona, surely ending any chances he had of making Brazil. Other familiar faces not in the match squad included 2008 final winning goalscorer Fernando Torres (in London watching on TV) and World Cup 2010 leading scorer David Villa (at the stadium in civvies). Many eyes were on Costa, Villa’s teammate at Atletico Madrid, the Brazilian-born striker who del Bosque has persuaded to switch allegiance to La Roja to add more aggression and directness to its attacking line. Costa played as a traditional number-nine, linking with the midfield line behind him to start moves, while also providing a target for crosses into the box and try and finish them. While the Atletico frontman looked at home with his teammates, he was well marshalled by the equally tough Italy defense. His best chance came late on, when an excellent turn lost marker Andrea Barzagli, but the shot was dragged just wide. If Costa was sometimes on the periphery of proceedings, Bayern Munich midfielder Thiago was generally right at the center. The former Barcelona prodigy made his debut for La Roja back in August 2011, but spent years on the fringes without regular starts at club level. The 22-year-old has clearly benefited from the faith shown in him by his former blaugrana boss Josep Guardiola in Munich, and looked extra-sharp and confident on the night. Can't get enough of the USA star? Check out her best career moments..
Thiago started deep in Xabi Alonso’s usual role in midfield, but driving forward and playing sharp, precision passes in the manner of Xavi Hernandez. He also provided thrusting driving-runs through the center, and was also spotted cutting out Italy attacks near his own area. It was hard to believe he was the five-cap novice in the center, and no surprise when it was Busquets [63 appearances] who made way when Alonso [109 internationals] entered at halftime. Thiago almost capped his performance with the opening goal soon after the break, but veteran Italy goalkeeper Gianluigi Buffon sprang from his line to save. That chance was created by David Silva, who added more zip to Spain’s attacks after replacing a subdued Cesc Fabregas at the interval. The Manchester City man was involved as the deadlock was broken, linking with Andres Iniesta — who had glided typically away from a few markers in midfield. The ball broke kindly to Pedro, and he rammed the ball through Buffon to net. The Canary Islander lacks the high profile of some teammates, but showed again his ability to snaffle up chances at this level. Another of those watching at home — Manchester United’s £40 million signing Juan Mata — must know it will be difficult to return to the squad now. There was less chance to impress in Spain’s defense, given Italy’s limited gameplan. Bayern’s versatile Javi Martinez stepped in for the injured Gerard Pique and did little wrong. More interesting was at right back, where Chelsea’s Azpilicueta made the most of 90 minutes. The Basque was tenacious in defense, and got forward well to set up a chance for Fabregas who skied his shot badly. The absent Alvaro Arbeloa, another veteran of previous tournament wins, looks an outside bet to travel now. Italy was missing two of its best players, with Mario Balotelli injured, and Daniele De Rossi absent for disciplinary reasons. And the absences showed. Coach Cesare Prandelli will have been happy that Argentine-born centerback Gabriel Paletta of Parma stood up well against Costa on his debut. Zenit St. Petersburg left back Domenico Criscito had a tough time against Pedro and was withdrawn early. Balotelli’s stand-in up front Dani Osvaldo almost curled a 20 yarder in the top corner in a rare Italy attack, but even the halftime introduction of veteran playmaker Andrea Pirlo did little to lift the visitors. In the end, Spain could have won by more, but the scoreline was neither coach’s main concern. 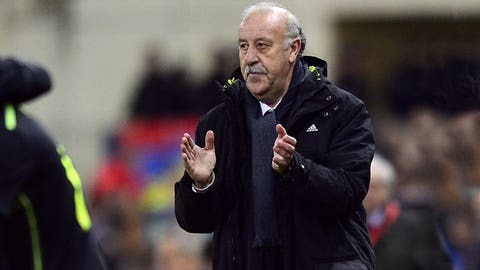 Del Bosque is a genial character who is however not afraid to make big decisions. His new men Thiago, Costa and Azpilicueta played the full 90 minutes here — and we will likely see all three again in Brazil this summer.